PRODUCT: ZURN Z121 12" Roof Drain, Low Profile 4-3/8" High Dura-Coated Cast Iron Dome, Dura-Coated Cast Iron Body, Gravel Guard/Clamp, No-Hub 4" Outlet. Price/Each. Dura-Coated cast iron body and dome. Combination membrane flashing clamp / gravel guard. Available in 2, 3, 4 and 6 in. outlet drains, and with Inside Caulk, Threaded, or Neo-Lok outlets. Other options available. See datasheet. Many Options available. See product data sheet below. 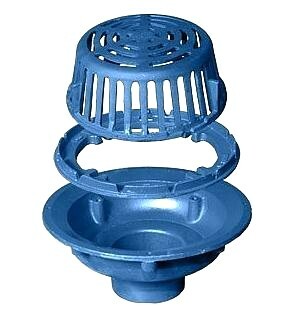 10 inch OD x 4-3/8 inch High Cast Iron Low-Profile Replacement Drain Dome. ZURN #56587. fits ZURN Z121/Z111 12 inch drains. Blue Dura Coated finish. Price/Each.